TKW’s first locomotive, SM03-348, built Chranow 1961, stationed at Bezwola Army Depot, donated to the Society by the Ministry of Defence in 2009. 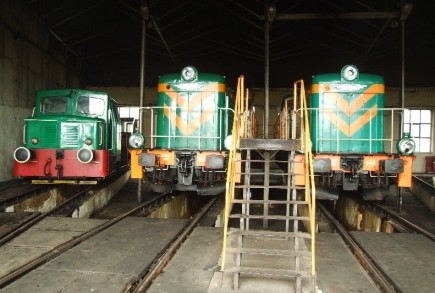 Newly arrived in Jarocin shed and photographed in the company of two PKP Cargo SM42s by Marek Ciesielski on 31 July 2009. Articles about the toxic relationships between Polish railway societies and their local councils have appeared with depressing regularity on BTWT, so it makes a welcome change for us to report on a group that have been working successfully WITH their local council for several years to set up a brand new railway museum in Wielkopolska. For several years the Jarocin Town Council have leased some space at the locomotive depot in Jarocin and allowed the Wielkopolska Railway Society (TKW) to store historic rolling stock there with a view to establishing a railway museum there when PKP Cargo ended their occupation of the site. In December 2010, PKP Cargo finally moved out and handed over the keys of the depot building to the Town Council who have asked TKW to administer the site. As well as maintaining a good relationship with the Council the Society also understands the need to develop the interest of the local community. In a novel and interesting development, two theatrical performances are taking place this month, on 20 May, and 27 May in an area of the shed that was adapted in recent times for the maintenance of road vehicles. The Jarocin project has lots going for it. It is only 90 minutes by car from Wolsztyn and can tap into the reservoir of talent that became disillusioned when PKP Cargo rebuffed the efforts of would-be volunteers who wished to paint some of the rusting steam locomotives that are languishing there. It is also close to some of Wielkopolska’s other historic railways, including the narrow gauge railways at Sroda, Pleszew and Zbiersk. Finally Jarocin is only 4 kilometres from Mieszkow, the junction for the branch to Czempin – the first 25 kilometres of which are disused; the remaining 20 kilometres (from Srem) carry regular freight trains run by SKPL. We await to see what other progress takes place with this fledgling project, and wish the TKW the very best of luck with their endeavours. This entry was posted on Saturday, 21 May 2011 at 16:01 and is filed under Jarocin, TKW. You can follow any responses to this entry through the RSS 2.0 feed. You can leave a response, or trackback from your own site.